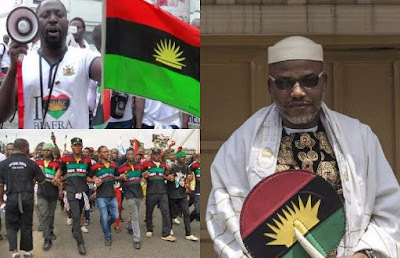 The Indigenous People of Biafra (IPOB) has responded to the presentation by the Defense Headquarters that the group is a terrorist association. The group said it was a peaceful movement and that it had never conveyed arms or killed anybody. IPOB's position was made known by Prince Kanu, the more youthful sibling of IPOB leader, Nnamdi Kanu amid a visit with newsmen on Friday. He stated: "It is, extremely bizarre that that is originating from a military insight officer. One, IPOB is a peaceful movement. "We don't convey arms; we've never approached anybody to execute for us neither have we killed anybody. On the off chance that you take a gander at our records, our records are perfect and straight." "From commencement, Nnamdi Kanu influenced it to clear to the entire world that we are peaceful flexibility warriors and that is the way it has been," Prince Kanu said. Reasons given by the Defense Headquarters for announcing the group a terrorist association incorporate the arrangement of a Biafra Secret Service, asserted development of Biafra National Guard, unapproved hindering of free streets; coercion of cash from guiltless civilians at unlawful detours, and activist ownership and utilization of weapons (stones, Molotov mixed drinks, blades and broken containers among others) on a military patrol on September 10, 2017.